Our government should not contract SEMLEX, a Belgian company whose credibility is questioned if not in the whole world but most parts of the world. SEMLEX and its CEO are subjects of police investigations for corruption and money laundering and yet the government of the Gambia is contemplating to give the production of our national documents such as ID cards, passports and even the possibility of producing our voter cards to Semlex. Recently, countries have cancelled contracts of producing their national documents with SEMLEX while we in the Gambia are awarding such a company whose credibility is in question. Comoros Islands just cancelled the production of their passport to SEMLEX on many grounds including its CEO printing a diplomatic passport for himself. One would wonder why with all these clouds of doubts over the activities of the CEO and SEMLEX Company that Gambian government is honouring the 2016 contract which was signed by the Jammeh regime. The argument advanced by the Minister of Justice recently was that cancelling such a contract would have some legal implications and possible financial implications. Yes, that sounded to have make some sense but would it not be more of a disgrace for our government to deal with a company whose reputation is in question by its home government? And would it also not make sense that yes it may have some financial implications and possible legal battle but would it not be worse when it comes to our reputation as a nation? In fact Pristine consulting firm which was the first to introduce biometric ID cards in this country is arguing that they do still have their contract valid. So, is it not wrong for our government to give the impression that by not awarding Semlex the contract, we will face the courts as indicated by our Justice Minister? Would it not also be possible that Pristine could also sue the government of Gambia for not honouring their contract? 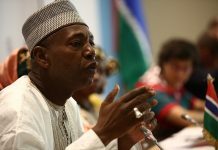 At one point the former Interior minister Mai Fatty told government that discontinuing the contract with Semlex, Gambia government would face the possibility of paying Semlex $100 million. This is all the more reason why the Daily News calls for a private investigation into the awarding of the contract of the production of our national documents to SEMLEX. We still stand by that position because we cannot understand why our government is bend on honouring a contract with such a company that more and more countries are cancelling contacts with. Can the government guarantee Gambians that this company will not give our national documents to none Gambians in other parts of the world. Can we the citizens be assured that our national documents will be secured; and above all if they are to print our voters cards how sure will our voter’s cards will be saved from being manipulated. These are worrying questions that are boggling the right thinking Gambians in and around; we are just coming out of a system where there have been cries that our voter’s cards, IDs and even passports fell into wrong hands. The government must tell Gambians how this bidding was done because going by the letter signed by Amadou Sanneh, the Minister of Finance, that there was going to be a bidding process which never took place. Another letter signed by Bulli Dibba, Permanent Secretary at the Ministry of Interior said the 2016 contract would be reviewed and advised government and we are not sure if the review took place. Next articleYoung Medical Doctors Must End Illegal Strike Now And Resume Work Pro Bono Pubico.